Don DeLillo, in Point Omega, has one of his main characters, Richard Elster, say, "The true life is not reducible to words spoken or written, not by anyone, ever." I am a long standing fan of Don DeLillo, starting from his magnus opum Underworld, to his lean novellas like The Body Artist and Point Omega, so any references in Chris Lambert´s novel Killer &Victim - the title of the book is indeed spelled like that - were in terms of prose and focusing on the micro-observations rather obvious. The first chapter in Killer &Victim is without irony named The Body Artist, and indeed a strange art performance is taking place in Alexander, the first crowd-sourced city. Lovingly nicknamed Paradise City, even no cold November Rain is mentioned, it is an proto-utopian city, even Lambert hardly waste time to describe it but mere fleeting moments. Instead he lets the characters perform as a mouthpiece for the city itself and their inhabitants. Lambert has his strongest moments when he has his characters go on in (almost) endless inner monologues about their relationship and life woes. His female characters are driven by real questions of one self, of philosophical ponderings and musings and giving life a meaning. I was impressed how Lambert characterized them, especially Kelly, and later on, Hera. However, if you expect something to happen you probably will be disappointed. 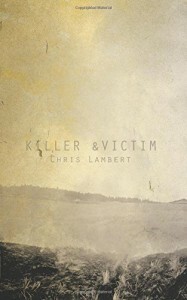 But at what Lambert really good is, is creating atmosphere and mood, the special something kind of vibe. The Body Artist, the chapter not the book, strongly reminded me nevertheless more of the opening scene in Point Omega with the 24 Hour Psycho showing, a slowed down version of the Hitchcock movie to a time span of 24 hours. I seem to remember a DeLillo interview where he said he visited the actual video performance by Douglas Gordon which at the time was showing in the MoMA, but I disgress. In some true DeLillo fashion Lambert creates a sense of dislocation and a disconnect from themselves within the context of various stages of relationships to and with each other. There are more noticeable influences, like Virginia Woolf or David Foster Wallace. One of the later chapters, Hera, echoes loudly James Joyce for example. Ulysses comes to mind of course with Molly´s soliloquy, who roughly corresponds to Penelope in the Odyssey. I know, no one ever made this far, but yeah, like that. Lambert, however, has more mercy with his readers than Joyce had, still the sentences are going on and on without (almost) any punctuation or pause, pages and pages of narrative description. He makes one work to go through Hera´s inner monologue while there is another strange event taking place, a mysterious photo shooting within a field of burning wheat - Phoenix rising from the ashes - and yeap, more Greek mythology, and here we are back at square one with Hera. Or as someone smarter than me said (thanks Ben! ), in Alexander, intimacy is consumed, dies and then idols are raised. And consumed they are, by fire, a burning desire or their own artistic creations. Not only consumed but also cleansed. Where art shows what is not always apparent in one´s life, where it can lead to self-awareness and discovery, where art and identity intersect, where art articulates incomprehensibile concepts of life and language (Olaf, I´m looking at you! Yours truly, The Critic), where art and identity become one and the same. The characters are definitely named with a plan and meaning. Minka, the strong/resolute one; Kelly, the warrior; or Hera - the Greek goddess of women and marriage but there are more implications like "for the meaning Mistress as a feminine to Heros, Master." Which is fitting as Kelly plans to propose to Minka after the show, and there is a bit of a backstory with Kelly and Hera already who are friends since age ten. Even the name of the city itself, Alexander, is a statement already. The "defender of men", of course mostly known due his most famous bearer, Alexander the Great who built a huge empire of his own making. But enough of that. I drive myself crazy, and disconnected even more to the already complex and challenging text when trying to find more meaning here. While there is a sort of absence of a real plot, Killer &Victim, lives strongly from its characters. The chapters themselves feel more like interrupting a larger context, a narrative yet to come, as those are ambigious plus there a lot of foreshadowing basically from page one. The ending, if there is anything like an ending (doubtful) is open... but less so to interpretation, more like another chapter in an ongoing story. Killer &Victim is no doubt a very headstrong book, not something to be consumed on the get go. It takes patience and a willingness to deal with mythology or philosophy as it is filled with metaphors, symbolism and themes. I have no doubt missed esssential information even while trying to deconstruct the novel in its single forms, nevertheless a satisfying read is a satisfying read.